Have you tried ziplining yet? Maybe it’s time, next time you’re in the area. 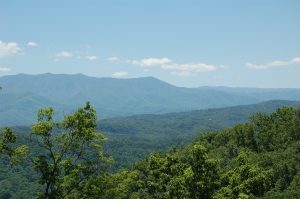 Soaring downhill above the treetops and through the beautiful Smoky Mountain scenery – it’s so safe a child of 3 can do it, and so exhilarating that even those with a fear of heights can relax and enjoy it. The Smoky Mountains boasts some of the longest and best zip lines in the world. Our friends at Legacy Mountain Ziplines have more than 400 acres of stunning scenery to play around in, as well as 4.5 miles of travel in 7 different zip lines – one of them is 2,500 feet long! We make it easy for you to go ziplining with a Free Adult Ticket to Legacy Mountain Ziplines as part of our Trip Cash book of free coupons worth over $400. It may sound a little wild when you think of being up to 450 feet above the ground, and moving as fast as 50 mph, but you don’t watch a dashboard when you’re ziplining, you’re simply immersed in the experience, with so much to see. As well as the mountain vistas, you can see a lot of wildlife from a zip line. Now you know what a bird’s-eye view is like – in fact, you’ll pass over and through a lot of bird habitat, and you can catch a glimpse of how the birds live, when gravity’s not a problem. The scenic sights available on the zip line rival the mountain views you would otherwise have to go hiking to find. And in the heat of summer, the welcome coolness of higher elevations is the same, except without the hike. 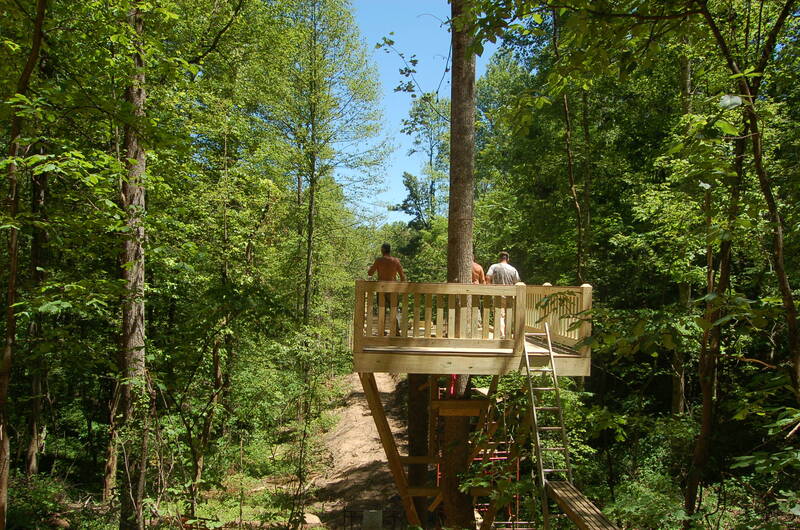 Legacy Mountain takes you by van up to the first tower of the Canopy Tour, where the adventure begins. Ziplining has proven itself very safe all over the world, and Legacy Mountain goes even further with double steel lines at all times. Zipliners can ride the wire in tandem also, a great arrangement for a parent and young child, or a guide with a nervous first-timer, or simply those who like each other’s company! Such a unique and unforgettable experience as ziplining makes a great way for all the family to spend time together and share a thrilling time – for confirmation, just look around and see everyone’s wide grins! It’s impossible not to be enthusiastic in a zipline tour, and it’s a great bonding experience for families, friends and groups. Legacy Mountain offers special rates for groups of 10 or more. Ziplining is a year-round sport, weather permitting of course, and each season has its own charm. Soar in the silence above the snows of winter, check out the wildflowers of spring, revel in the warmth and greenery of summer, or blow your mind with the famous fall colors from your amazing vantage point. Zipliners should be moderately healthy and without heart or back conditions (and not pregnant). Casual clothes and shorts are fine but no open-toed shoes. Children as young as 3 years are allowed at Legacy Mountain, but any rider under 100 pounds must ride in tandem, and no single rider can be over 275 pounds – the weight limits aren’t for safety but simply to ensure adequate glide and momentum between the towers. 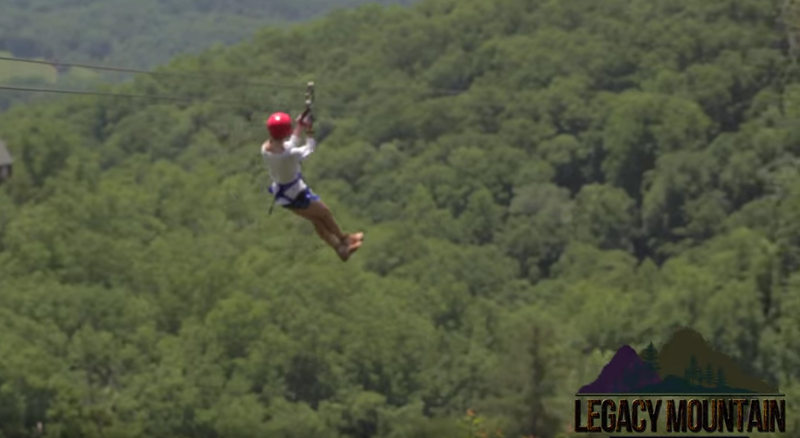 Legacy Mountain Ziplines is located just up the road from Pigeon Forge in Sevierville. The full Zipline Canopy Tour runs 3 times a day with extended hours in spring and summer. Ziplining is by reservation – as far in advance as you can please, for this very popular attraction – so before you go, make sure to check the website (see below) for the requirements and reservations. 2431 Upper Middle Creek Rd. 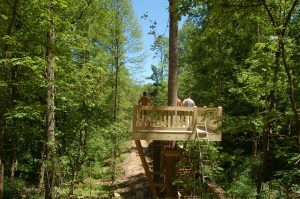 This Free Coupon to Legacy Mountain Ziplines is just one of many Free Tickets that Cabins of the Smoky Mountains guests receive in our Trip Cash book of free coupons worth over $400.